The most sold app in the store in it's genere. 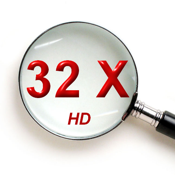 32X Flash Magnifyer HD is the most powerful Magnifying Glass of the AppStore. You can get up to 32 magnification while maintaining image quality. Ideal for reading words in small print and expiry dates. Just move the slider on the screen to switch from 2 to 32 magnification of the image. You can enable or disable the viewfinder just touch the screen.